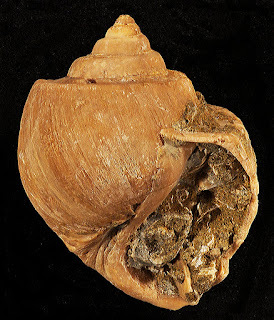 This post concerns another common ampullinid Eocene shallow-marine gastropod (for comparison, also see my recent post on Eocernina hannibali). The gastropod is Pachycrommium clarki (Stewart, 1927), a Eocene shallow-marine fossil known from southwestern Washington to Baja California Sur, Mexico. It is found only in lower to upper Eocene strata, thus is it an excellent index fossil for the Eocene time interval (approximately 55 to 36 million years ago). Pachycrommium clarki is medium in size. The picture on the left is the front or apertural view of an adult specimen (68 mm height) of P. clarki. The picture on the right is the back or abapertural view of the same specimen. This gastropod is characterized by having an inflated smooth last whorl, moderately elevated spire with tabulate (squared-off and indented) whorls, thin but persistent umbilical callus, and a slit-like umbilical pit. Although it would seem as if the morphology (shape and size, etc.) of this species is well defined, in reality, there are not that many characters. In addition, there has been little information provided as to how constant these few characters are and how much they are subject to variability, caused by paleoenvironment factors or even growth stage (juvenile vs. adult). I have seen variability for this species in the height of the spire, shape of the spire whorls, extensiveness of the umbilical callus, and development of the slit-like umbilical pit.